We make our chiles en nogada based on an old family recipe from Yuriria, Guanajuato that dates back at least until the 1950’s. 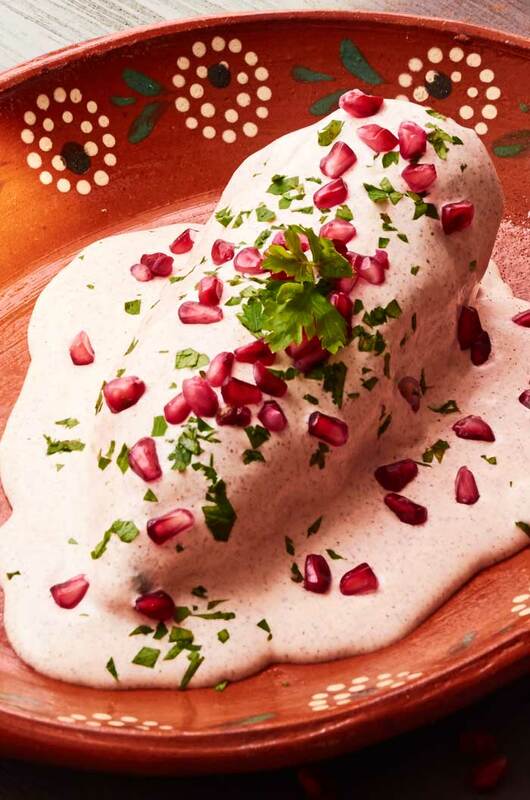 Chiles en nogada are meat stuffed poblano chiles bathed in nogada, a walnut cream sauce and garnished with pomegranate seeds and parsley. 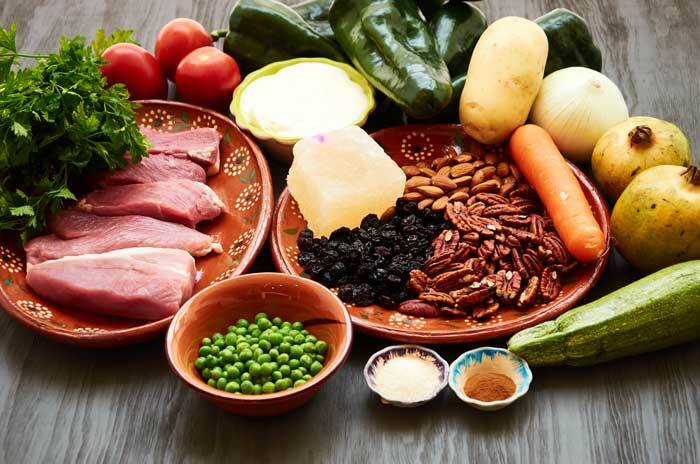 It is a festive dish typically served in the month of September to celebrate Independence Day because the colors of the dish are said to resemble the colors of the Mexican flag, green, white and red. 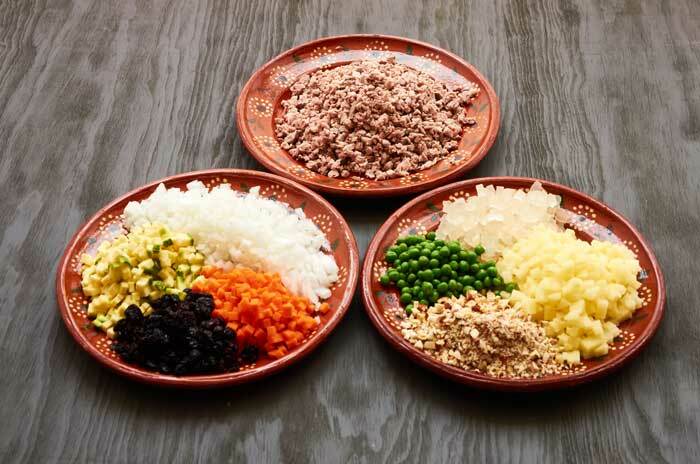 In Yuriria, the filling is prepared with beef, pork and biznaga, candied cactus which adds a delicate sweetness. Biznaga will be almost impossible to find but you can replace it with the equivalent amount of any candied fruit or dried fruit with excellent results. 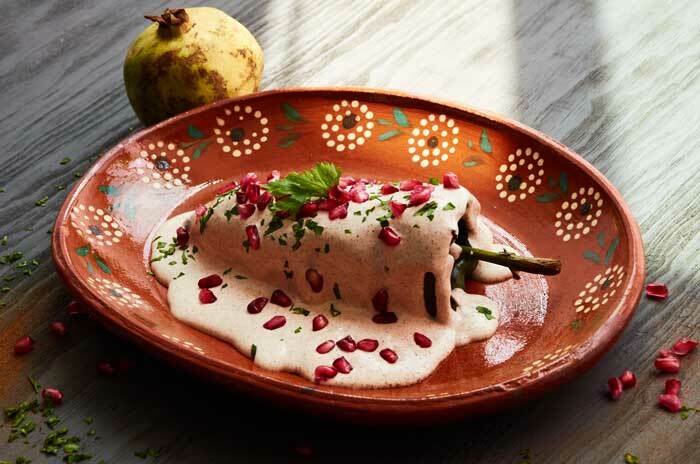 Chiles en nogada is not a difficult dish to prepare but it does require you to dedicate some time for preparation. Your time will be rewarded with a sophisticated, deeply satisfying dish with knockout presentation perfect for a special occasion. Love and attention to detail matter. 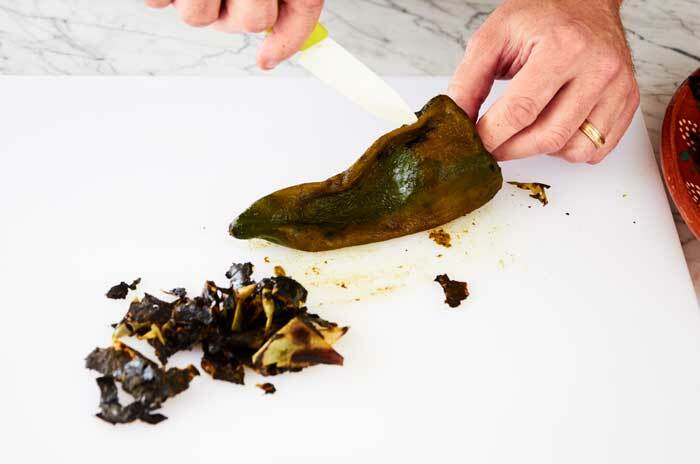 For a truly special dish, you must make the effort to chop all of the ingredients into uniformly sized pieces which will give you the most beautiful presentation. Be sure to lay out all of your ingredients beforehand and double check your ingredient list to make sure that you have all ingredients on hand. You don’t want to start cooking and then realize that you have forgotten a key ingredient. We speak from experience on this one. Double checking avoids swearing loud enough for your neighbors to hear. 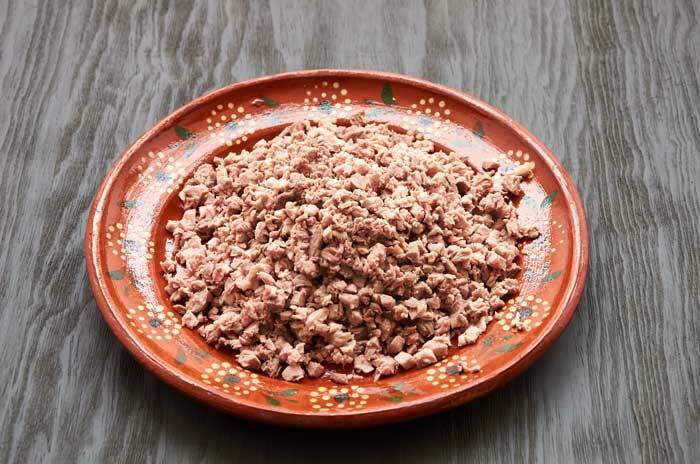 Many chiles en nogada recipes call for ground beef or pork. 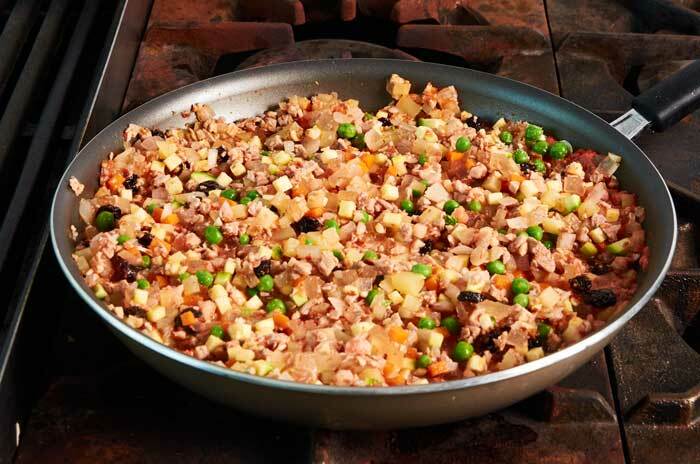 This one calls for chopped beef and chopped pork. 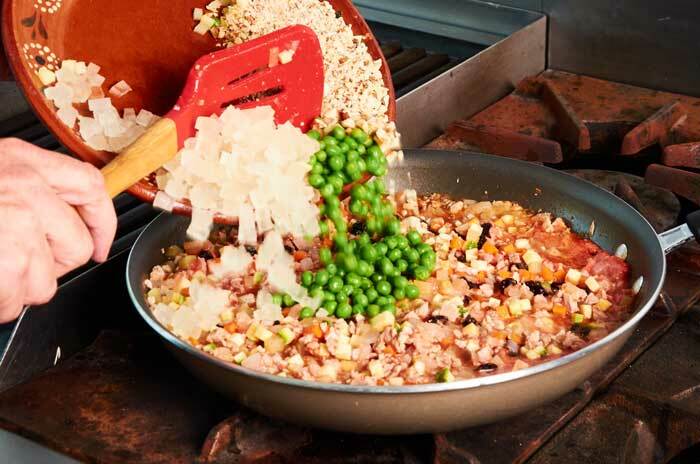 It is definitely more work to prepare chopped meat instead of ground but we feel that it gives the dish a much better texture and flavor. 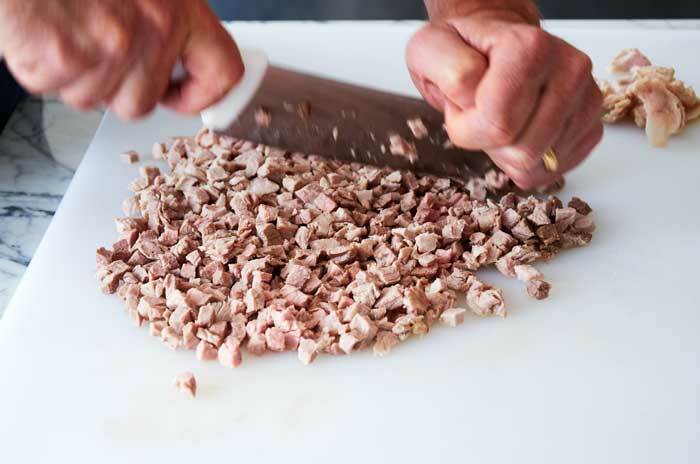 If you don’t want to prepare chopped meat ground meat will still taste great. It’s a matter of personal preference. Place the meat in a pan and just cover with water. Bring to a simmer and cook the meat until just cooked through (about 20 minutes) turning once. 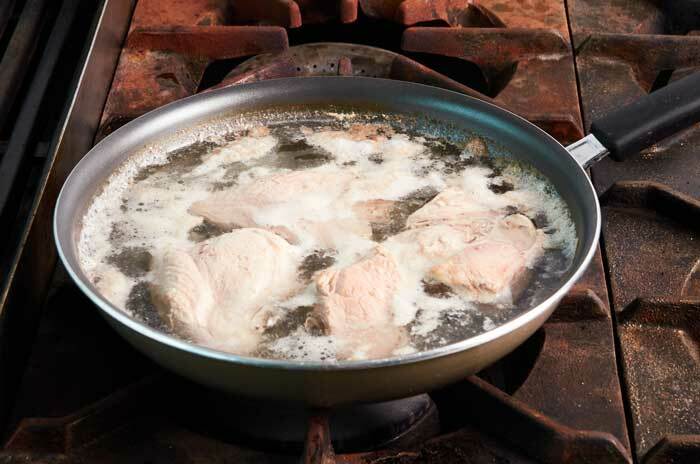 When the meat is cooked remove it from the pan and allow it to cool to the touch. Reserve the cooking liquid. You will use it to prepare the tomato puree. Chop the meat into cubes. The meat should look like this. 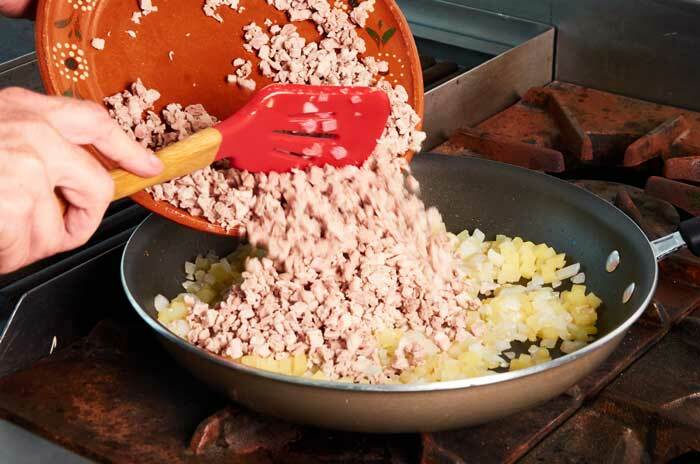 Be sure that the meat is chopped into evenly sized pieces. 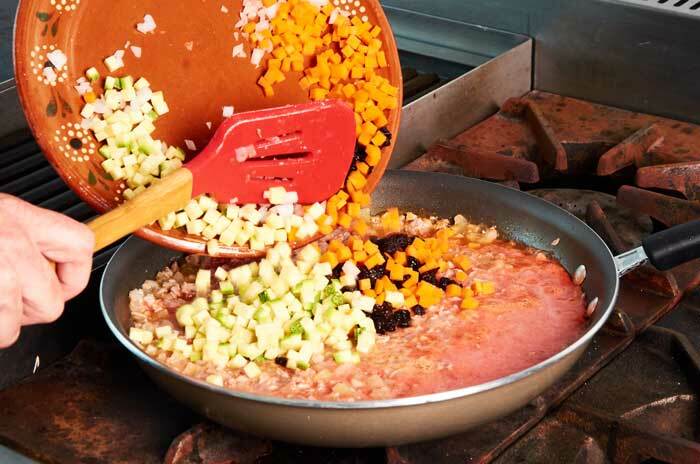 Before you can cook the filling you need to chop the onion, carrot, zucchini, potato and candied fruit into 1/4″ cubes. The almond should be very finely chopped. Don’t chop the peas or raisins. Just as you laid out all of the ingredients before starting preparation lay out all of your chopped ingredients before starting to cook the filling. 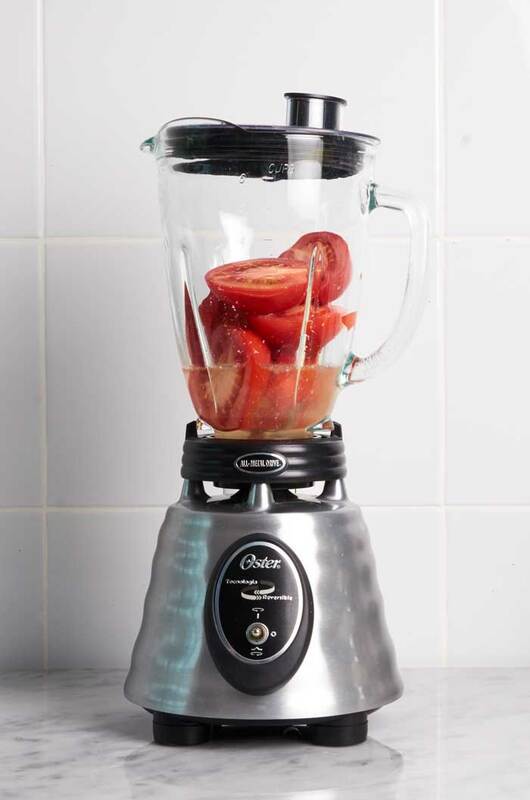 Slice the tomatoes in half and add them to your blender with 1/2 cup of the cooking liquid from the meat. 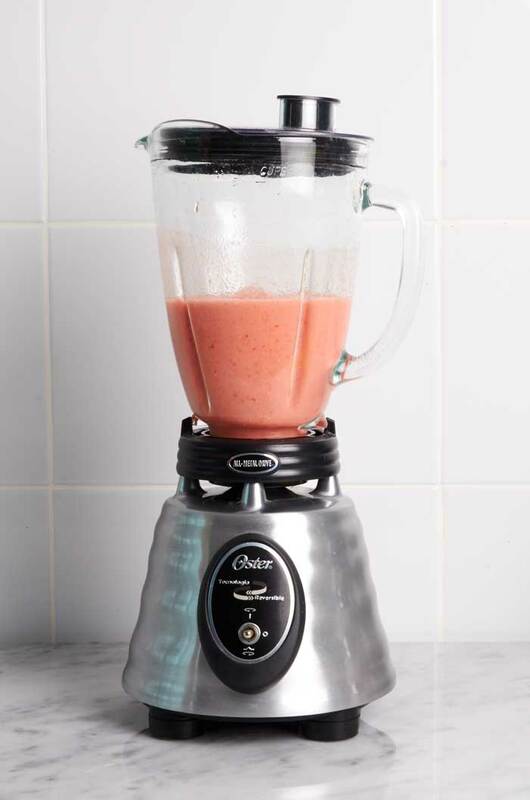 Blend until smooth but not liquefied. Now comes the fun part, cooking the filling. 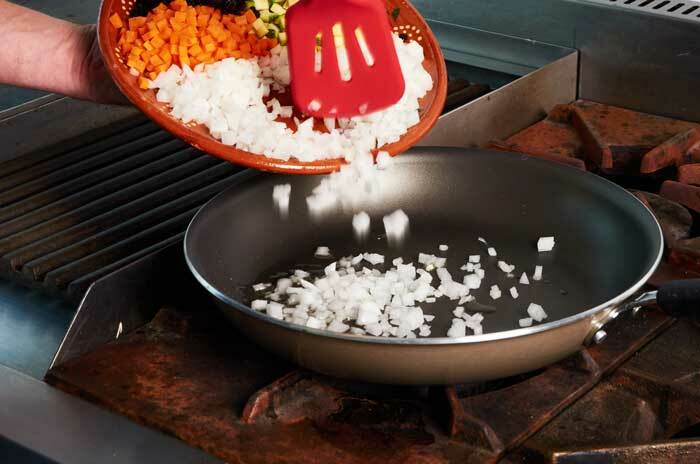 Start by frying the onions in 3 tablespoons of oil for 2 minutes. Then add the potatoes, stir and cook for 5 minutes. Add the chopped meat and stir. Add the carrots, zucchini, and raisins and cook for 5 minutes until the tomato puree is starting to reduce. Add the peas, biznaga or candied fruit, almonds, brown sugar and cinnamon. stir well. Cook for 15 minutes until all of the vegetables are fully cooked and tender and the liquid is reduced. Don’t cook until dry. You want the filling to be moist but not wet. Note: If the filling starts to get too dry before all of the ingredients are fully cooked add the cooking liquid from the meat a few tablespoons at a time as needed. 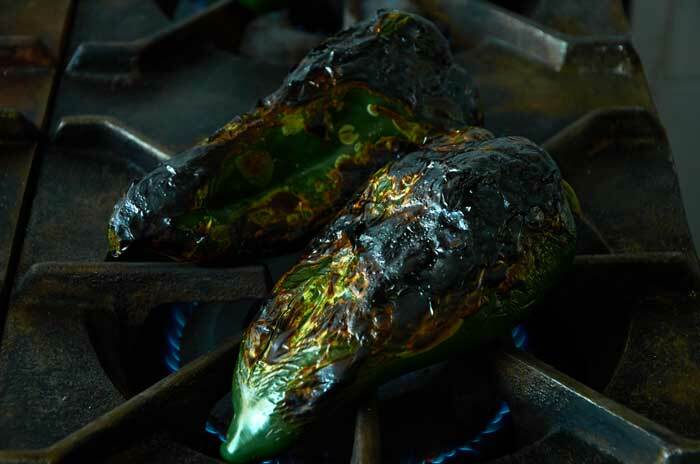 The poblano chiles must be roasted and cleaned before being stuffed. 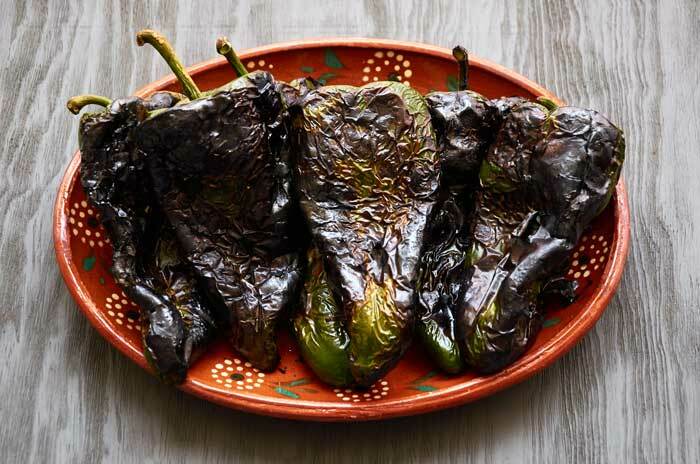 Choose chiles that are shiny with smooth skin and are firm to the touch. 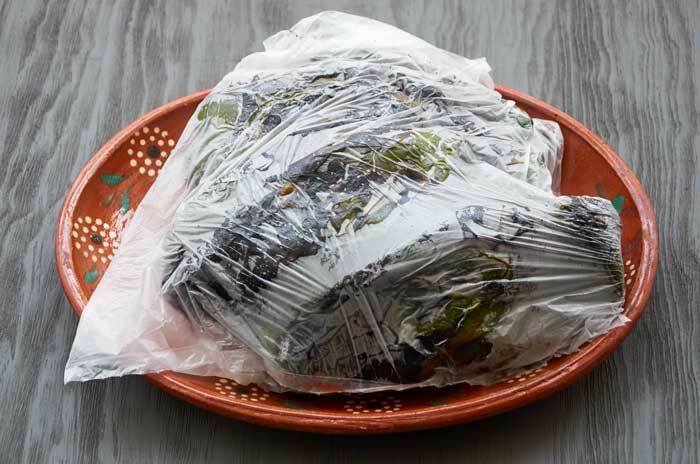 Wrinkled chiles mean that they are old and won’t hold their shape well when being stuffed. 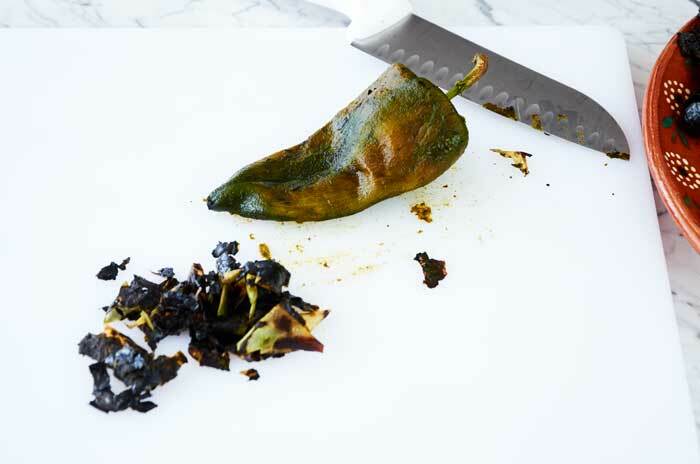 Place the chiles over the open flame on the burner on your stove. You do this to blister the skin so that you can peel them. Note: Do not leave the chiles unattended. Blacken the skin on all sides. Once you have blackened all of the chiles place them in a plastic bag to sweat them. This helps loosen the skin even more. Once the chiles have cooled enough that you can handle them it’s time to clean them. Very gently scrape the skin the chiles with the blade of a knife. Remove as much skin as possible. 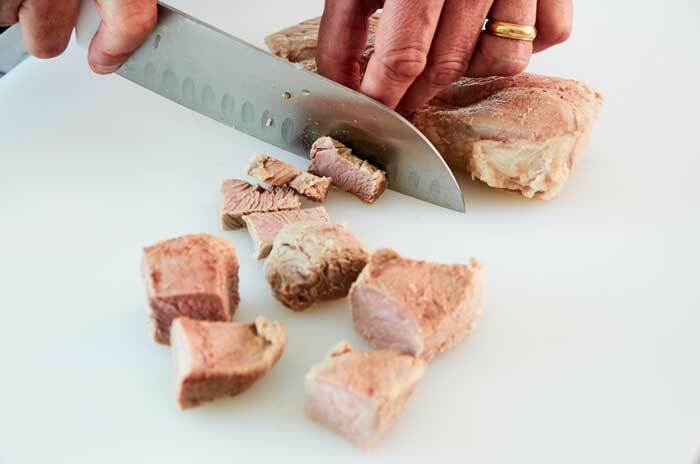 You will probably have to use your fingers after using your knife to remove the remaining bits of skin. 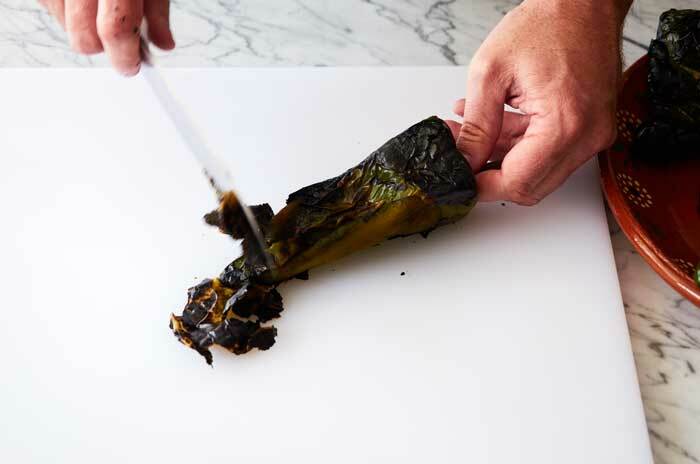 Using a small knife, gently split the chile down the side without cutting all the way through the tip of the chile. The chiles have a seed pod on the large end at the base of the stem. Carefully use your fingers to remove the seeds. If you are unable to remove all of the little seeds with your fingers you can place the chile under running water to remove them. This chile is ready to be stuffed with the filling. 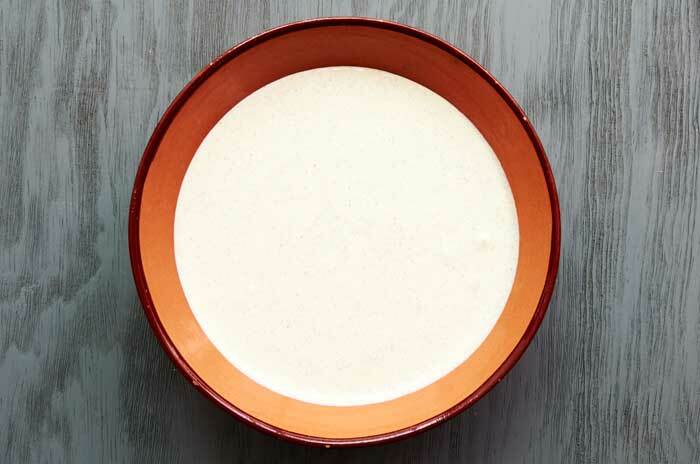 Once you have prepared the filling and cleaned the chiles it’s time to make the nogada, the creamy walnut sauce. 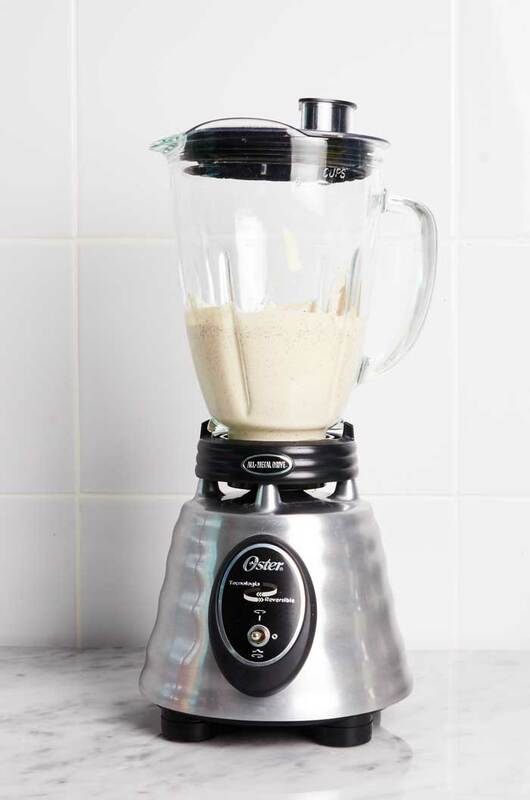 Place the cream, walnuts, cinnamon and brown sugar in your blender. Note: You must use Mexican cream not sour cream. Blend until the walnuts are completely incorporated into the sauce. You don’t want chunks of walnut in the sauce. Smoothness counts for the sauce. STEP 5. – Serve the Chiles, Yeah! It’s now time to serve. Woohoo! With a small spoon or your fingers remove the seeds from the pomegranates into a bowl or onto a plate. Mince the parsley. Leave a few whole leaves for decoration. 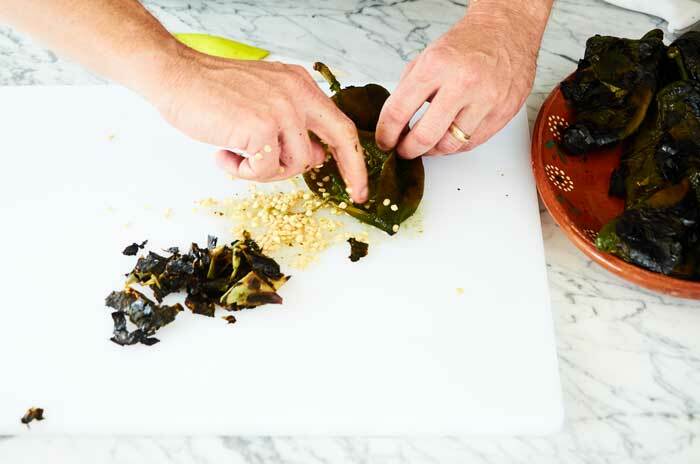 Fill each poblano chile with enough filling so that it will just close. You don’t want the filling to spill out the side of the chile onto the plate. If the chiles won’t stay closed you can use toothpicks to close them. Place 1 stuffed chile on each plate. Spoon enough nogada over each chile to completely cover it. Sprinkle with pomegranate seeds and minced parsley. Top with 1 or 2 leafs of parsley. Chiles en nogada are served gently warmed with the sauce at room temperature. Looks delicious, doesn’t it? Provecho! 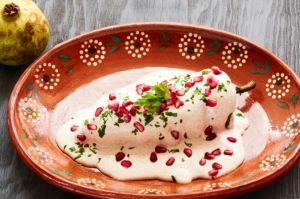 Recipe for authentic chiles en nogada based on an old family recipe from Yuriria, Guanajuato that dates back to the 1950's. 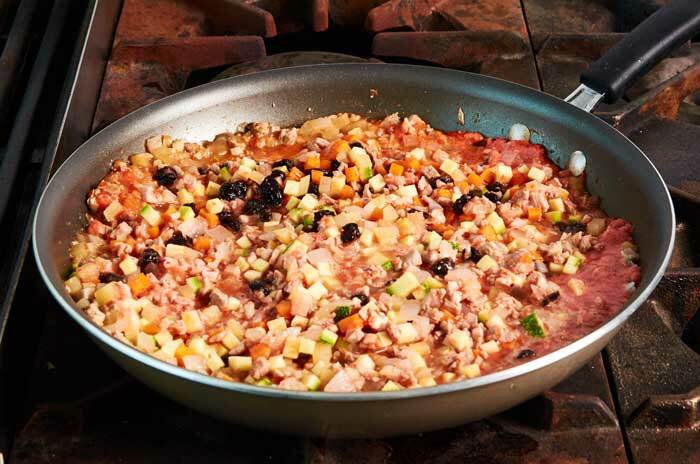 Filling includes beef, pork and biznaga, candied cactus that gives the dish a delicate sweetnes. 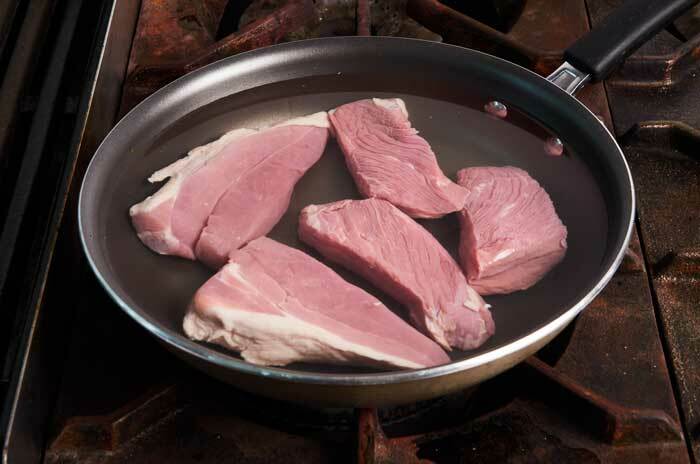 Place the meat in a pan and just cover with water. Bring to a simmer and cook the meat until just cooked through (about 20 minutes) turning once.When the meat is cooked remove it from the pan and allow it to cool to the touch. Reserve the cooking liquid. 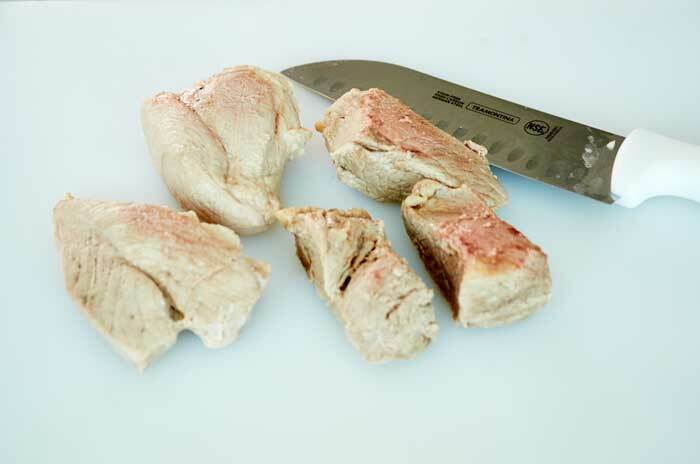 Chop the meat into cubes first then chop finely. Chop the onion, carrot, zucchini, potato and candied fruit into 1/4" cubes. Chop the almond very fine. Fry the onions in 3 tablespoons of oil for 2 minutes. Add the potatoes, stir and cook for 5 minutes. 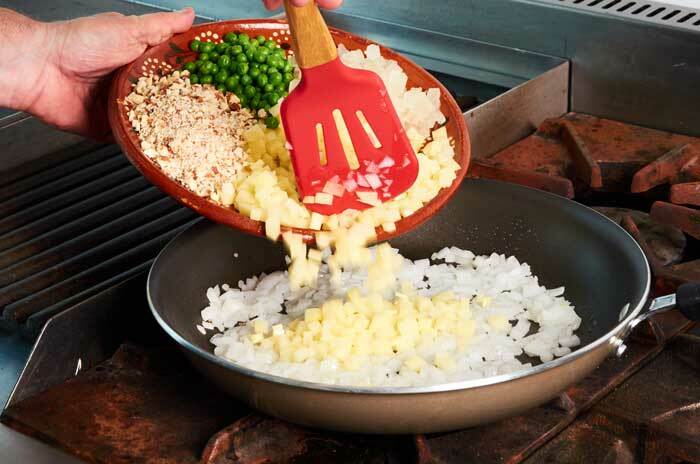 Add the peas, biznaga or candied fruit and almonds. stir well. Cook for 15 minutes until all of the vegetables are fully cooked and tender and the liquid is reduced. 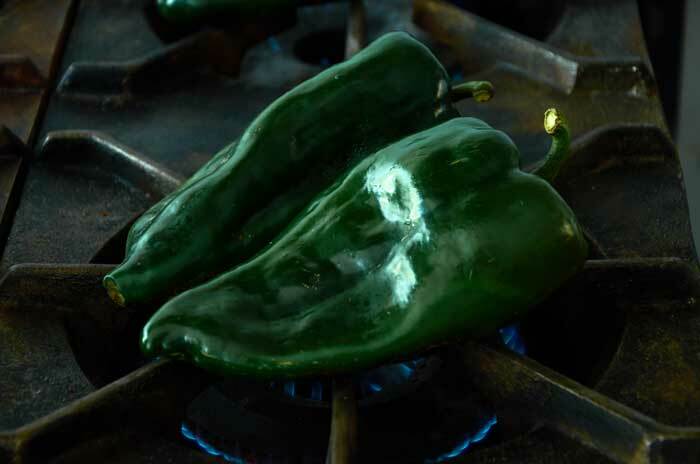 Place the chiles over the open flame on the burner on your stove. Note: Do not leave chiles unattended. Blacken and blister the skin on all sides. When you have roasted all of the chiles place them in a plastic bag to sweat them. Scrape the skin the chiles with the blade of a knife. 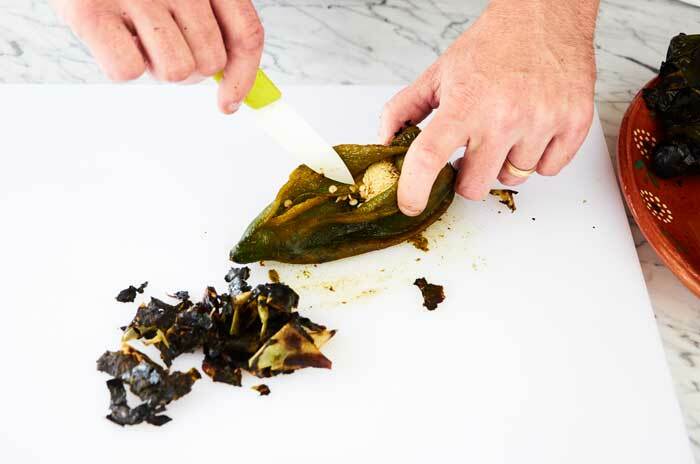 Remove the seeds inside the chile with your fingers without tearing the chile. Place the cream, walnuts and cinnamon in your blender. 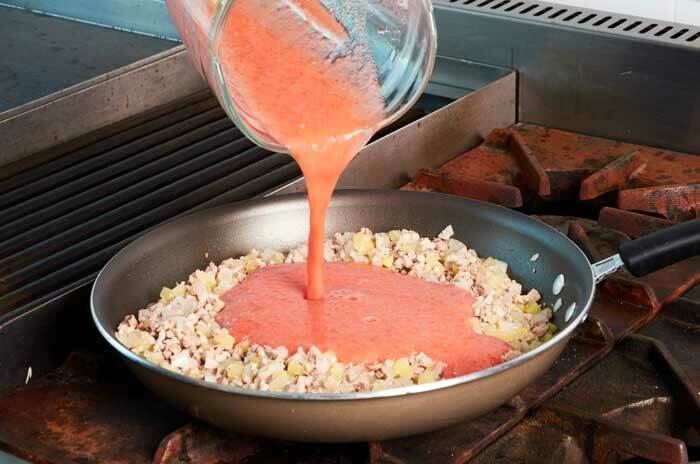 Blend until the walnuts are completely incorporated into the sauce and the sauce is smooth. Slice the pomegranates in half. 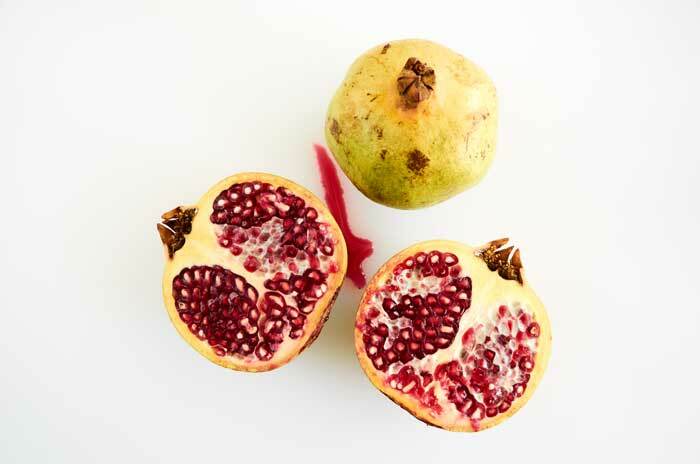 Remove the seeds from your pomegranates. Chop the parsley very finely reserving a few leaves to use as decoration. 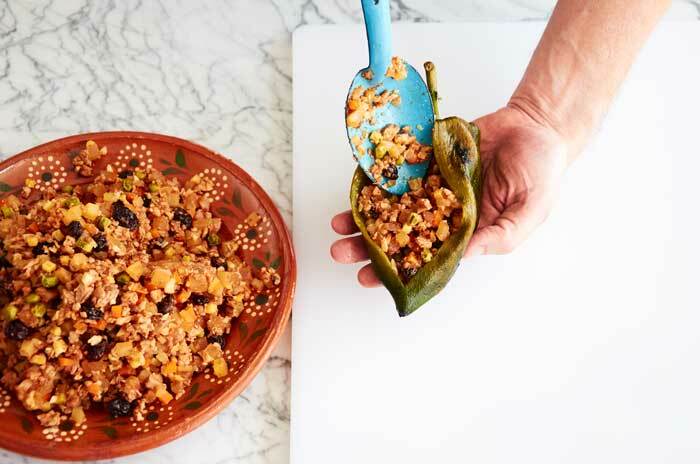 Fill each poblano chile with enough filling so that it will just close. Use toothpicks to keep each chile closed if needed. 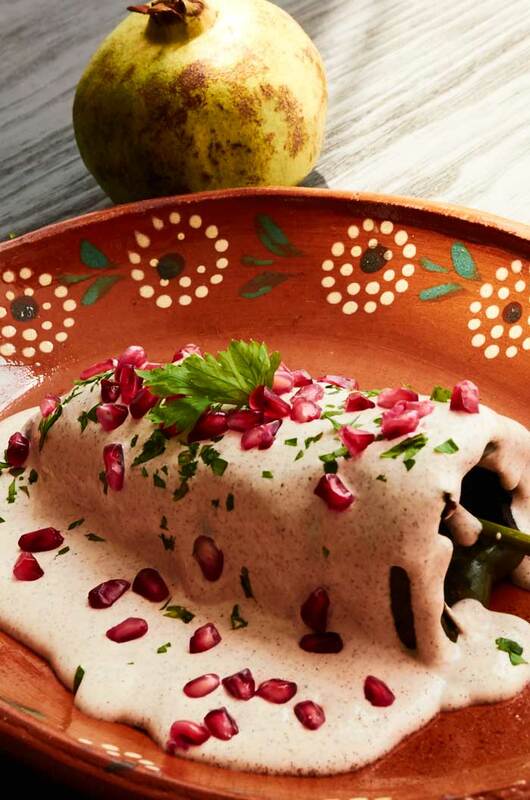 Spoon nogada over the stuffed chile until the chile is completely covered. 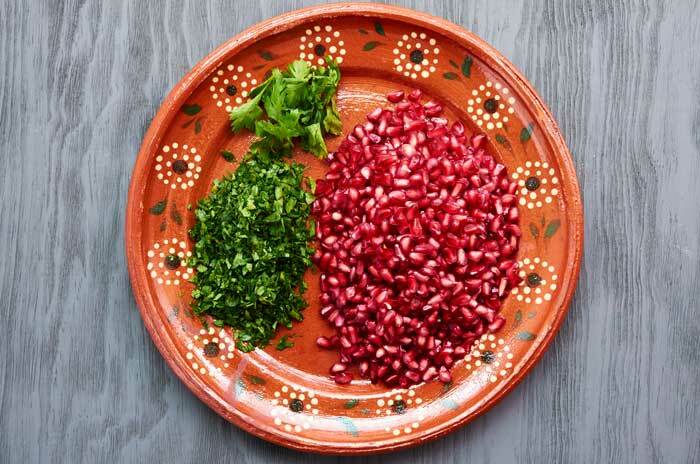 Sprinkle pomegranate seeds and chopped parsley over the chile covered in nogada. Decorate with a 1 or 2 parsley leaves. If you have time, allow the filling to rest for 2 hours so that the flavors can meld. I had it for the first time while having lunch with my friend Ivan from the South of Mexico. From Mexican Cuisine,since I’ve lived in NYC for 34 years and was unfamiliar with Mexicans seasonings and cooking. It’s just like in the movie “like water for chocolate”. Amazing balance of textures, acidity, sweetness and tartness. 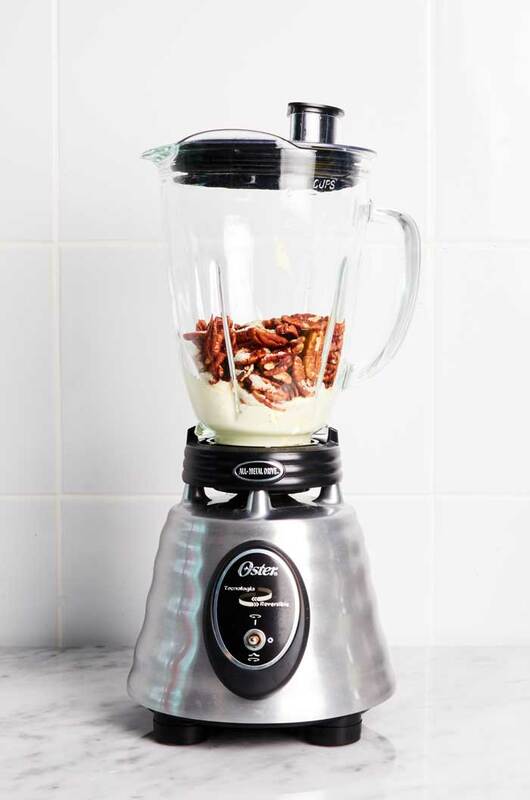 Love the careful, step-by-step instructions and all the photos, but I’m a bit confused–recipe calls for walnuts, but the nuts shown in the photos are pecans. Can I conclude that pecans are just as good–or better? Pecans or walnuts are both great choices for this recipe. Provecho! This was a spectacular dish. But what I enjoyed most about this dish is how creative and how beautiful it is – probably one of the most beautiful and meaningful dishes I’ve made. I’m glad I had found your recipe to make this. I love how the colors represent the Mexican flag, a mark of true creativity because the flavor profiles work so well together too! I really appreciate the clarity of this recipe and how it is presented. Just the right amount of information, and the photos are great. 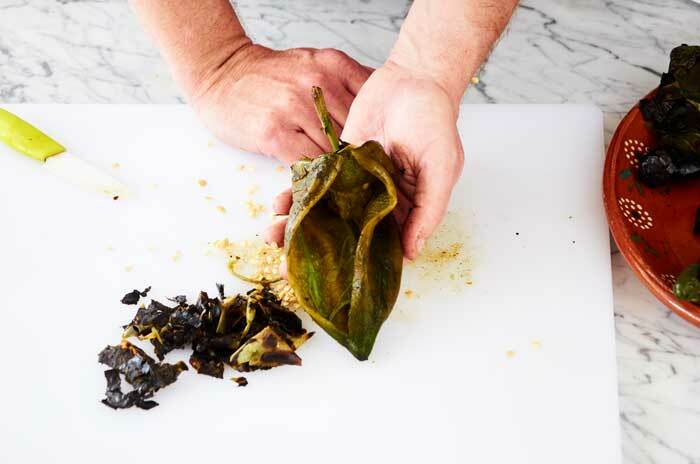 One question: once the chiles are stuffed, do you put them seam-side-down on the plate? Or do you leave them seam-up, more like little boats that will get filled with crema on top of the filling? Thanks! I was just wondering what types of cuts to use on the meats. I’m going to make this recipe for a school paper about cultural food experience and I want to make sure I do it right. This is an absolute lie, the Chiles en nogada dates back to the 1820’s independence of mexico originally from the state of Puebla, Mexico. Refer to Monjas Clarisas or the convent of Santa Monica in Puebla, Mexico.